Draped in her trademark white sari and unperturbed by the hot and sultry weather, Mamata Banerjee on Friday took oath for the second consecutive term as the Chief Minister of West Bengal at a mega coronation ceremony that saw over 140 VVIPs and thousands of locals turning up. The feisty CM led the star studded swearing-in ceremony and took her oath in Bengali, followed by 42 ministers that included 18 new faces. She is the state's eighth chief minister and the first woman to occupy the post. 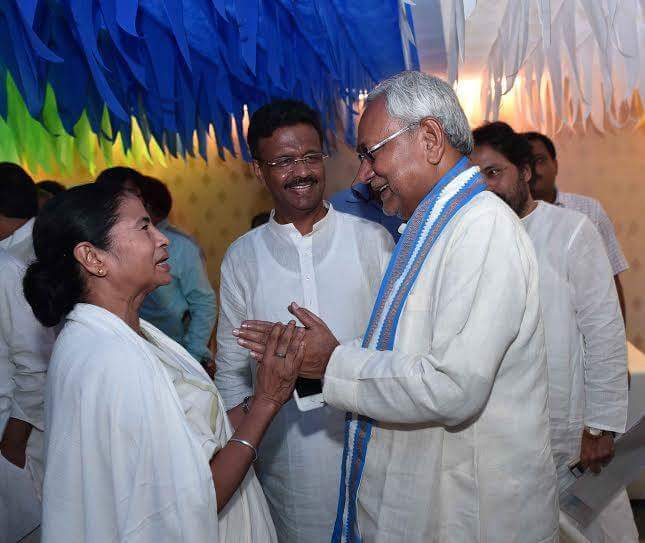 Seated in the centre of the grand dais constructed on the historic Indira Gandhi Sarani (Red Road) that was dipped in Mamata’s favourite colours -- blue and white, Banerjee smiled and waved through the ceremony. Meanwhile, each newly appointed minister after taking oath sought ‘Didi’s’ blessings and wished her with folded hands or touched her feet. Around one lakh people were present to watch the ceremony in the heart of Kolkata and the police had to erect barriers to stop vehicular traffic and control the crowd. Kolkata Mayor Sovan Chatterjee, former Indian cricketer Laxmi Ratan Shukla and noted singer Indranil Sen were among the 18 new faces who took oath along with Mamata. The strength of the ministry is 42, including the chief minister, Banerjee announced on Thursday, after submitting the list to Governor Keshari Nath Tripathi at the Raj Bhavan. There are three women and seven members from the Muslim community in the ministry. Although the opposition Congress-Communist Party of India-Marxist (Congress-CPI-M) alliance and the West Bengal Bharatiya Janata Party (BJP) boycotted the event, the list of VVIPs included Bhutan Prime Minister Tshering Tobgay, Bangladesh Industry Minister Amir Hossain Amu, union ministers Arun Jaitley and Babul Supriyo, chief ministers Arvind Kejriwal (Delhi), Akhilesh Yadav (Uttar Pradesh), Nitish Kumar (Bihar) and former Jammu and Kashmir chief minister Farooq Abdullah attended the ceremony. West Bengal Chief Minister Mamata Banerjee on Friday said her government would target the youth for the next five years in the state. After assuming office for the second time, Banerjee distributed portfolios to her 41 ministers and discussed key points of action in the first meeting with the cabinet of ministers. "We have to target young generation. Agriculture, industry and employment generation has to be oriented," she told the media after the meeting. In addition she said the state chief secretary has been asked to start the formal process of formation of five new districts that were announced before the assembly polls.